There are 3 posts in this thread, and it has been viewed 4193 times. 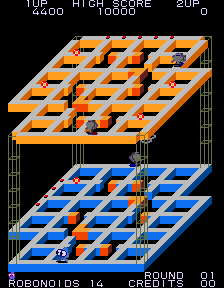 Marvin's Maze. What do you think of it? Beat Dang up on the Matrix Frame. 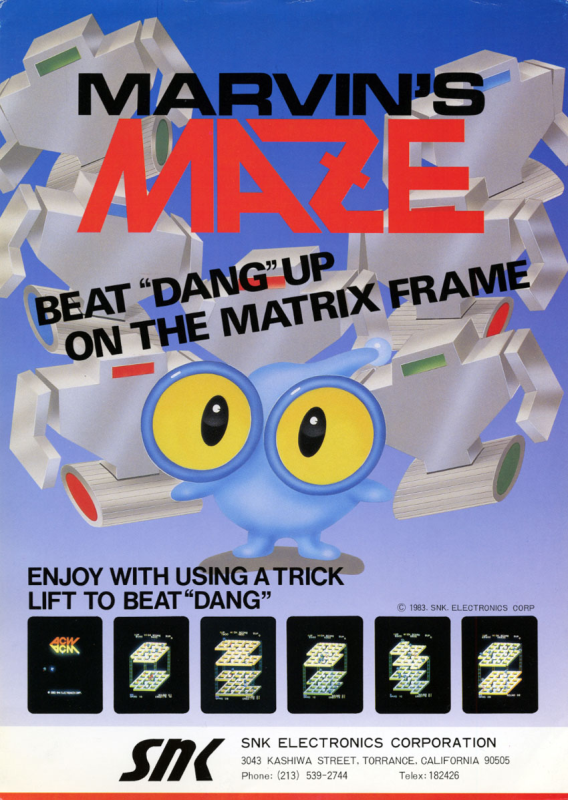 While reading this notable line on the Arcade Flyer for Marvin's Maze I was rather thinking of certain West Coast Gangsta lyrics than of a tagline for a Pacman clone from 1987. Anyway, we're dealing here with SNK's own version of Namco's evergreen classic. SNK additionally added an isometric view and a second platform to walk on, which can be accessed by elevators. The player actually takes control of a guy called Marvin who makes more resemblance to Q*Bert than Pacman. At some points Marvin is allowed to shoot at his robot enemies or removing the ground from under them, what makes the game a bit deeper than Namco's original. 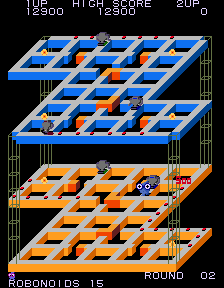 Marvin's Maze is a maze game where the player fight against Robonoids while trying to clear the maze of dots. There are two ways to finish each rack: eating up all the dots, or destroying a certain number of Robonoids (listed at the bottom of the screen). 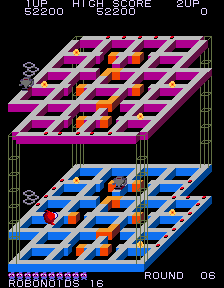 Two ways to destroy the Robonoids: shoot them, or remove the ground from under them at certain points of the maze (the Trick). I went with general consensus on this one: never heard of or seen this before. Looks alright. Not my kind of game though. Find them repetitive and boring I'm afraid. Never played it. The fact that you can shoot the enemies also makes me think of Wizard of Wor, a very awesome Atari game.